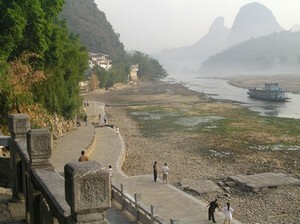 Yangshuo - The China Taichi Guide is a Directory of Tai Chi Schools & Tai Chi Teachers in China. 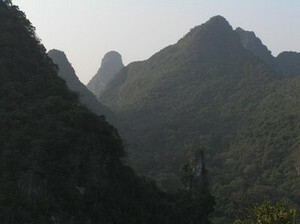 Yangshuo is in Southern China, not too far above Hong Kong, near to the city of Guilin. It is the one of the top tourist destinations in China, famous for its beautiful scenery - the inspiration for much of China's art work. This has meant that the local infrastructure has developed and is suitable and enjoyable for Western tourism. 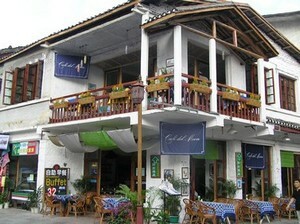 It is a beautiful place to stay for a while and have a holiday at the same time as learning Tai Chi. Yangshuo has always been an interesting town. Because of the beauty of its surrounding countryside, it found itself part of a fascinating Chinese experiment in early tourism and benefited from a relaxation of the control that existed elsewhere in China. The rest of China has taken almost twenty years to receive the same sense of freedom, but Yangshuo still has a different feel. Most visitors to China feel more comfortable in the Yangshuo area than in any other region of China. The town itself has been tastefully developed to provide a more beautiful ambience than the early Communist grey buildings, blending the older wooden buildings with newer ones. 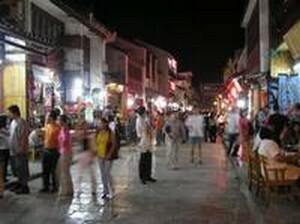 The town is famous all over China for its 'West Street' which has had shops and restaurants catering to Western tastes for the past thirty years, though now the Chinese tourist market is really where the focus is going. Shopping has always been a major Yangshuo occupation for visitors and there is a very wide range of craft goods available here, mostly hand made in ethnic minority villages in Guangxi and Guizhou Provinces. Yangshuo is attracting high quality artists to itself and there are now several galleries with high quality Chinese art for viewing and purchase along with other shops displaying Chinese silver work, silk weaving and many other goods. As well as having many high quality traditional Chinese restaurants, Yangshuo has a few restaurants focused on meeting the needs of the Western tourist market. Menus are in English as well as Chinese and Chinese dishes have been adapted to suit Western preferences which makes everything a lot easier for people unfamiliar with Chinese culture. Western dishes and deserts are also available. The restaurants are fitted out to provide an ambience that is unusual still in China. There are also high quality Chinese fish restaurants serving the local delicacy of river fish cooked in beer along with a host of other dishes. A real treat for special occasions. 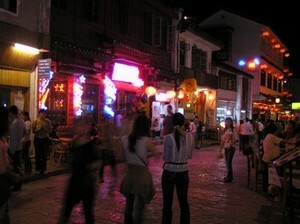 Ironically West Street, which started life meeting the needs of Western backpackers, has become a genuine tourist attraction in its own right for Chinese tourists who come to savour the unique atmosphere there. It has become famous all over China. 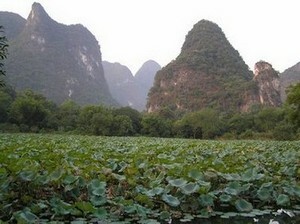 Most visitors to Yangshuo come to see the surrounding countryside. Yangshuo is situated next to the beautiful Li River (Lijiang) in the centre of the most stunning Karsk Limestone mountain area in China. It really has to be seen to be believed, an artist or photographers paradise. 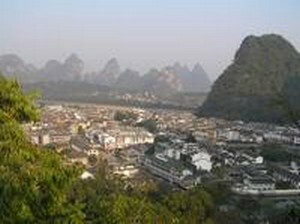 If you climb one of the hills, the mountains go on and on into the distance, but it is easy to reach exceptional places from Yangshuo either by taxi or by bicycle which are easily rented in Yangshuo town. 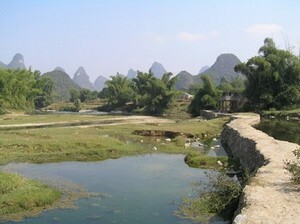 Cycle trips out to Moon Hill are part of the Yangshuo experience. The author recently completed a private boat trip along the Li River from Xing Ping to Yangdi and after visiting this area for the last 14 years, I was completely blown away again by the beauty of the scenery on this stretch of the River. It truly is one of the special places on the planet. 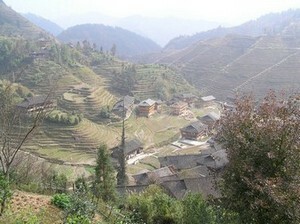 Longsheng is a mountain area approximately 3-4 hours North of Yangshuo and is easily reached via tours from Yangshuo. Again this area is simply one of those amazing places on Earth. 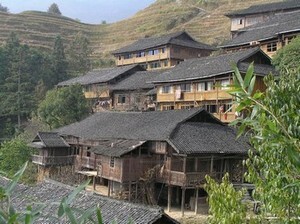 The local minority Zhaung and Yao tribes have carved the landscape here for over 800 years to make a subsistance living in this mountainous area. This is a great place to visit for a day or preferably a couple of days with time to walk among the hills and enjoy this quiet place. Not work for the faint hearted! There is no particular tradition of Tai Chi in Yangshuo, but Tai Chi has always been taught there to tourists passing through. It was natural for this to evolve into large scale teaching and so several schools have formed in the area around good Tai Chi practitioners - see Yangshuo Tai Chi Schools for more information. The Yangshuo climate is an interesting mix of the tropical weather which comes up from the South and the cooler more temperate weather which comes down from the North. As such it is not easy to predict the weather pattern for a given year as each year is different depending on larger scale weather patterns. January - Winter : Quite cold but snow and frost is very unlikely. Temperatures will be 5-10°C probably, but sunshine is possible which makes things more comfortable. Tai Chi is still possible with plenty of warm clothes but not so comfortable. February - Winter : Still quite cold and can be wet, but this is not a bad time to visit. Some years have a dry sunny winter and so this period can be beautiful and surprisingly warm at times. March - Early Spring : Temperatures rise a bit 10-15°C. It can be quite wet but this doesn't disturb the Tai Chi training so long as there is a roof to train under. This is a good time to study. April - Late Spring : Temperatures rise to 15-20°C perhaps and there is a higher chance of 'perfect' weather but it can also be a wet period some years. 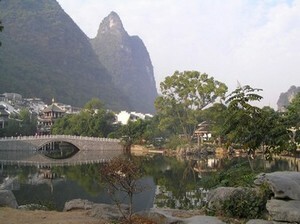 This is a very nice time to study Tai Chi in Yangshuo. 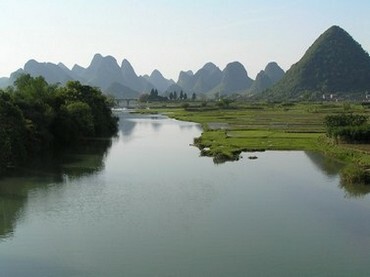 May - Early Summer : Temperatures are 20-30°C increasing through the month as Yangshuo moves into Summer. This is a beautiful time for most of China. June - Early Summer : As May but slightly hotter. Tai Chi is best practiced out of the sun, early and late in the day. July / August - Summer : Temperatures are often hot 30-34°C and humidity is high. 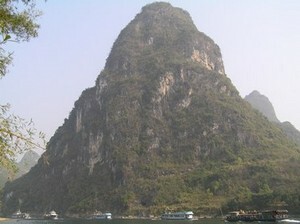 Many days will be sunny and beautiful and this is a peak time for the Yangshuo tourism generally. As with June, Tai Chi is best practiced out of the sun, early and late in the day. There can be heavy rain for short periods during the Summer which cools the air. 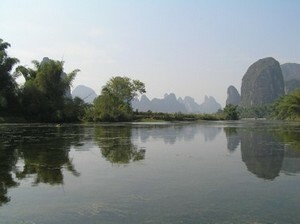 September - Late Summer : Temperatures fall slightly and this can be a very beautiful time in Yangshuo. September is a good time all over China. 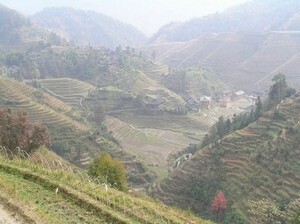 October - Early Autumn : Again this is a beautiful period in Yangshuo. It can be hot still some years or ideal with temperatures 20-30°C and sunny. 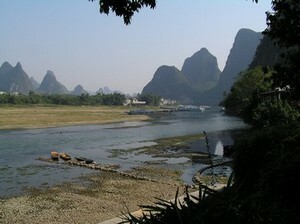 November - Autumn : As with October it is generally an amazing time to be in Yangshuo, but some years are less reliable. It has been quite wet and cloudy for the past couple of years (2015-16). December : Early Winter : This is still a good time weatherwise though air temperatures drop quickly through the month. It is possible to have sunshine and clear blue skies right through to Xmas, in which case temperatures later in the morning onwards are very comfortable. Hong Kong, Bangkok, Beijing, Guangzhou and Shanghai are major travel hubs and can be reached from most international airports. From Hong Kong, you can fly direct to Guilin or alternatively take the the new high speed train from Guangzhou to Yangshuo (3hrs). It is fast and very good value. Especially a good option if you fly into Guangzhou. From Thailand the flights to Guilin are very convenient and often reasonably priced with China Southern Airways. By Air : Guilin airport is the nearest airport and as this is a tourist area , it is well connected to the rest of China. From Beijing or Shanghai there are many flights each day to Guilin. Taxis direct from Guilin airport to Yangshuo are expensive 500Y+, however if you have already booked with a Tai Chi school, you can email them before you arrive with the time and flight number and they should arrange a taxi to meet you at the airport with a card showing your name etc. at a cost of about 250Y. This is recommended especially for night time arrivals in Guilin. There shouldn't be a problem arriving at night as a woman in Guilin airport as long as a taxi is pre-booked. I'd mention any concerns you might have and seek reassurance from the school. 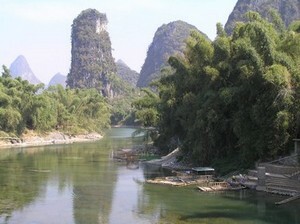 There may also a low priced bus to Guilin, where you can arrange a taxi by yourself for about 200-250Y. Between Guilin and Yangshuo there are two modes of public transport : Government direct buses between the Yangshuo Bus Station and Guilin Bus Station which cost 20Y and take an hour and a quarter and Private Mini Buses between the Yangshuo Bus Station area and the Guilin Railway Station for about 15Y which take longer. The latter are a stopping service and we do not recommend you use them especially when travelling with luggage. There have been reports of crime on these buses. The owners may try and take advantage of your ignorance and persuade you to take them, but we recommend walking to the bus station. 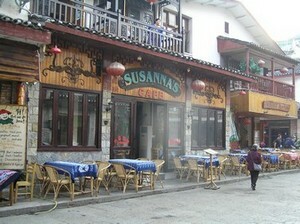 Yangshuo has accommodation to suit most people and budgets. Brand new hotels providing a good standard can cost 250Y - 350Y per night for a double room, but there are very good hotels just two or three years old offering comfortable rooms for 120Y-180Y per night. Lower prices of about 2000-3000Y a month may be available if you pay in advance for a long-term stay, but the prices rise dramatically during Chinese holiday periods - Chinese New Year (Jan / Feb for two weeks), May 1-5 and October 1-5. 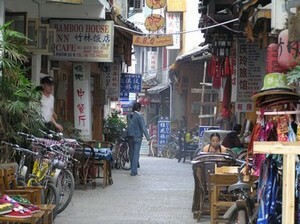 Yangshuo is a popular tourist destination and prices have risen significantly in recent years. Compared to Western destinations though it is still extremely good value especially if you leave the tourist areas and shop or eat where locals like to go. Tourist restaurants provide good quality, safe food for 30-50Y per meal near West Street and the surrounding tourist areas. Generally it is also safe to eat in places catering to local people or in the markets and then the prices of food drops dramatically. A breakfast of rice porridge and steamed bread or pork dumplings in the market will cost as little as 8Y, a main meal 12Y! 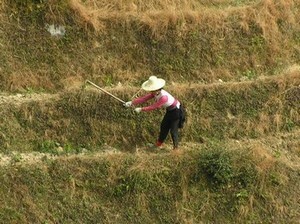 The China Taichi Guide : An Introduction to Yangshuo. Yangshuo, near Guilin, Guangxi Province is a very beautiful area and an easy place in China for international people to reside for long periods and learn Tai Chi. The China Tai Chi Guide is a directory of Tai Chi Schools and Teachers in China.